The next time you see or meet a midwife, please show them some love and appreciation – you may just make their day! A report out this week from the Royal College of Midwives highlights the fact that almost half of midwives in the UK suffered from work related stress. Having worked with so many midwives over the last 10 years, I find this deeply saddening and feel that we could all do more to help Midwives feel more appreciated and valued. When you consider that pretty much every midwife became a midwife because they were passionate about helping women and their babies, there is something seriously wrong when half of them find their job has taken a toll on their emotional as well as physical well-being. It is also shocking that 46% of midwives suffered from stress compared with only 33% of paramedics who deal with far more traumatic and life threatening situations. midwives. One of the most challenging areas for midwives is often from other colleagues – especially senior colleagues – a very sad 32% of midwives had experienced bullying, abuse or harassment from NHS staff in the previous 12 months. And yet much of this stress and harassment is unreported with only 37% saying that they reported the most recent experience. And even with those statistics, it is testimony to the dedication and passion of midwives as over half of all staff (58%), reported that they often or always look forward to going to work, with 74% of staff feeling enthusiastic about their job. tell them what a positive influence they have had on your day….show them some love! A few kind words can do wonders to help reduce stress and help them feel valued. My little “token of love” to all midwives I can’t meet face to face, is to offer them my Midwife’s Companion hypnotherapy track for free. 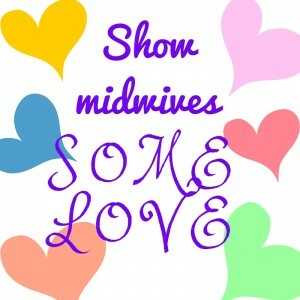 So please share this blog on your social network so more Midwives can feel the love!